Evolved Approach to Sales & Marketing Outperforms Outdated Ideas… Evolved Expression! I believe in going the opposite direction. Definitely not following the typical norm or conventional wisdom. And one place I want to continue shaking that up is marketing. 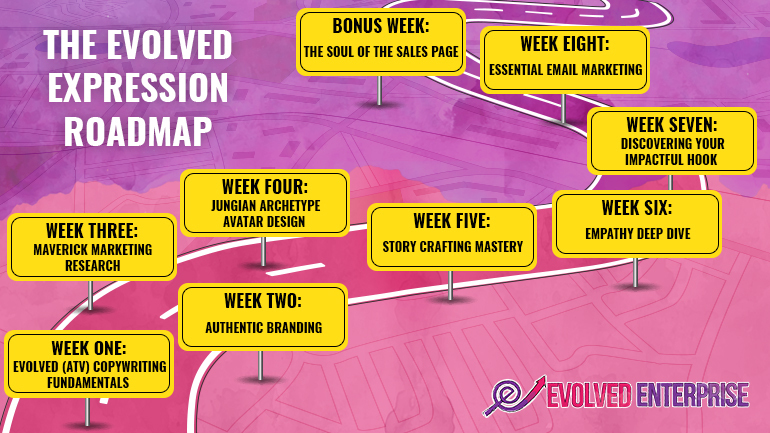 Last week we released the Evolved Expression course, co-created with my Apprentices. I really wasn’t sure about it. I didn’t know if anyone would be interested. I didn’t know if we could get busy, world renowned instructors to come together and spend their time sharing this new view of marketing and advertising. I was afraid that our concepts of Authenticity, Vulnerability and Transparency would be seen as “weak” and inconsequential… or it would be viewed as a given (certainly not true).. But as more and more instructors came on board to support the project… from Sally Hogshead, brand creation guru, to Mitch Russo the guy that ran Chet Holmes and Tony Robbins company, to Chris Haddad, one of the greatest copywriters around, I started to realize that we were all on to something here. This way you come out the other side leaving behind all of the “ickiness” of selling as usual... while actually gaining the marketing upperhand with more profit, impact, and joy. Looking forward to teaching you the marketing strategies.